Contrary to popular opinion, the name of the Rock-Ola company of Chicago, which became famous for the production of distinctive jukeboxes, has no connection to rock ’n’ roll. It is in fact a fortuitous coincidence that the firm’s founder was actually called David Cullen Rockola. 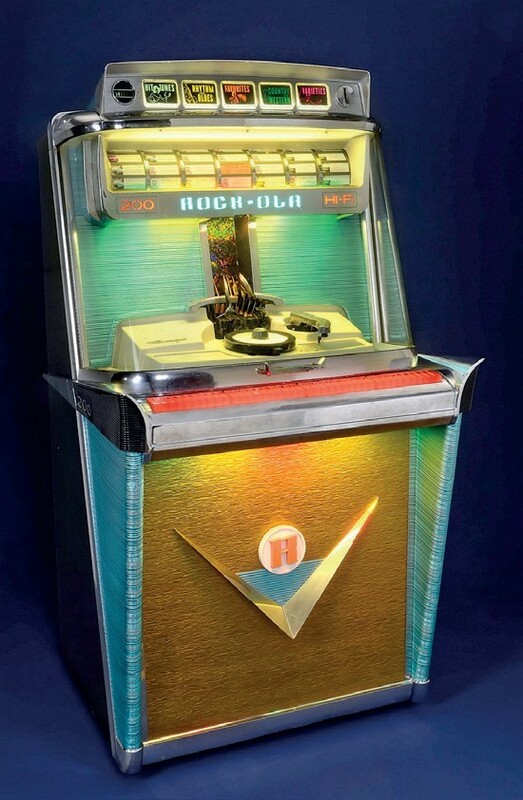 On May 18, Auction Team Breker in Cologne is offering this jukebox, a Rock-Ola Tempo I, model 1475ST, from 1959, with an estimate of €7000-9000. In 1927 he founded his Target Skill Machine Company which at first produced an attachment for a chewing gum vending machine, but later added all sorts of coin-operated machines to its portfolio. Around 1935 the first jukeboxes from the Rock-Ola Manufacturing Corporation, as the company was now called, came onto the market and were an instant hit, second only to those of Wurlitzer. On May 18, Auction Team Breker in Cologne is offering a Rock-Ola Tempo I, model 1475ST, from 1959. It houses a stereophonic valve amplifier and a rotating drum with room for 100 singles, both sides of which can be played giving a choice of 200 tunes. The estimate is €7000-9000.